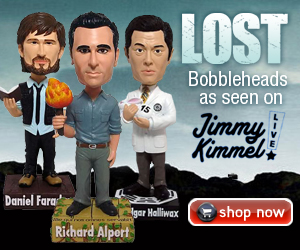 @BifBangPow: New LOST bobble heads debut on Jimmy Kimmel Live! I already ordered my Richard Alpert one! But they were sold out a few hours after it was released!! Please make a Juliet bobble head! I agree. I was a little disappointed that there weren't more characters to choose from that have been on the show longer. I would've bought a Juliet Burke one because she's also one of my favorite characters.